The S7 will only be offered as a 13.3-inch Ultrabook but gets a 2560×1440 IPS screen in some regions with Haswell CPUs (Core i3, i5 and i7 options) along with (and this might be the best news) a 47Wh battery. The original was a rather weak 35Wh pack. Given the efficiency advantages with Haswell, battery life will be hugely improved. 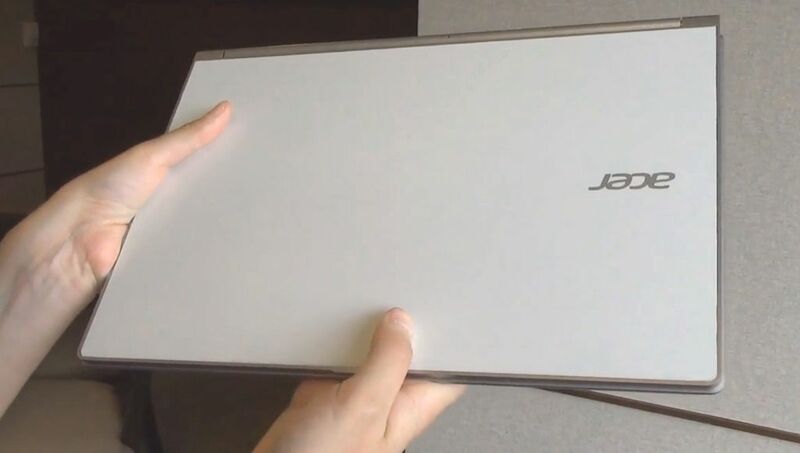 Acer Aspire S7 and S3 now looking much the same…from the outside. The Acer S3, a budget Ultrabook, has been completely re-worked and now looks like the S7, which confuses us somewhat although there are a few important differences. It’s heavier, doesn’t have Gorilla Glass on the lid and looks a little fatter. That size difference allows Acer to offer GPU options and a 1TB drive. There’s a 1080p screen too. The S7 will start at €1,450 in Europe (a very high price) and the S3 at €999. Acer have a press release, shown below but here’s Engadget’s hands-on first. 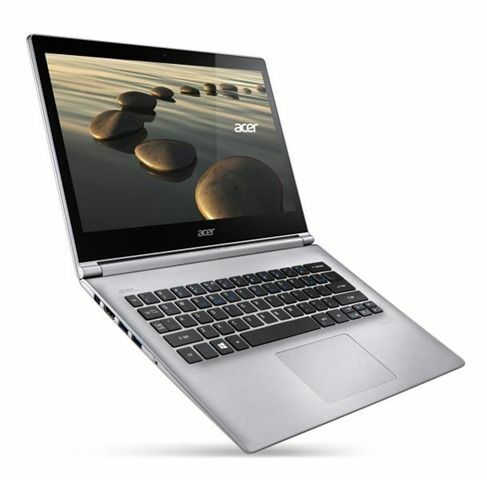 “We designed the S7 to be the best touch Ultrabook® in the world, bar none,” said Jim Wong, Acer Corporate President. “We listened carefully to users to find substantial ways to make it even better.” The re-engineered S7 delivers improved battery life of up to 7 hours, a 33% increase from its predecessor. Its new light-sensing EL backlit keyboard is also refined, with a deeper keystroke for more natural and comfortable typing. Plus, thanks to 2nd generation Acer TwinAir cooling technology, the noise at maximum load is more than 20% lower than the previous S7, keeping the system quiet and cool. Acer’s new S7 supports Intel® WiDi technology, which allows users to extend their laptop screen to a TV or big screen without a cable. With this feature, S7 users can stream video on their living room screen and open a new window on their computer and to work, bringing a new dimension to multitasking. The Aspire S7-392 features Acer’s first 10-point touch WQHD display will also be available on the S7, with IPS technology squeezing a very impressive 2,560×1,440 resolution into a 13.3-inch screen. In addition, IPS technology shows consistent and accurate colors at viewing angles up to 170 degrees. Taking advantage of the touch benefits offered by Windows 8, the touch-enabled screen on the S7 can be opened a full 180°, and the image orientation reversed with a simple hotkey combination for easy touch-and-show sharing. This new S7 packs powerful technologies, including dual-array microphones and Acer’s proprietary PurifiedVoice technology, which enhances speech performance and reduces noise for voice recognition and VOIP applications, making voice communication crystal clear. Moreover, it is powered by a 4th generation Intel® Core™ processor and a RAID 0 solid state drive for fast wakeup and read/write times, as well as quietness. TAIPEI, TAIWAN (June 3, 2013) – Acer today announced the launch of the new 13.3″ Aspire S3 Ultrabook™ at Computex Taipei. The S3 has inherited some of the industry-leading design and innovations of the Aspire S7, making it an impressively stylish and productive PC. As on the celebrated Aspire S7, the S3’s patented dual-torque hinge design allows users to easily open the lid up to 180° for sharing content, while keeping the display wobble-free for an outstanding touch experience. With Acer TwinAir cooling technology, the S3 is always cool to the touch without sacrificing performance. The light-sensing keyboard auto adjusts its brightness to ambient light for better visual comfort in dim settings. In addition, evoking the family design and visual purity of the S7’s gorilla glass cover, the new S3 cover is made from aluminum and sprayed Sparkling White with a mirror-polish finish; the operation area is made from anodized aluminum throughout. Just 17.8 mm thin and weighing only 1.67 kg, this Ultrabook™ is slim and easy to carry anywhere. The S3 has intuitive features that make it a joy to use. Acer Fast Resume enables the Aspire S3 to resume from Sleep mode in just 1 second, giving it tablet-like responsiveness and waking up 3x faster than a standard Ultrabook™. And users no longer need to press the power button as the system will automatically boot up when the display is opened – even if the computer has been shut down. When it comes to entertainment, the Acer S3’s 1080p Full HD display renders movies, photos and games with exquisite clarity. The display with IPS technology ensures vivid and accurate color reproduction, with a 170° wide viewing angle that keeps images bright and clear, even when seen from the side. Users can also wirelessly share their favorite digital content on a big screen with better visuals and sound quality via WiDi technology. Plus, with unique Acer Purified.Voice technology, communicating with friends and family sounds crystal clear. Acer’s S3 is available with a 7.2 mm 1 TB hard disk for storage, with the capacity to keep up to 250,000 MP3 songs or 150 FHD videos, and 290,000 8 MP photos – plenty of room for essential entertainment on the go. 7 hours with 47WHr may mean its actually not better per WHr, since they are saying “up to”. Also, they are saying 33% improved battery, but features a 33% bigger battery. I’m not certain but perhaps driving a 2560×1440 display drains battery faster than a 1080p display. That makes the point of having a higher resolution display very questionable. If its true, its the difference of the S7 that could have had 10 hours of battery, versus 7 hours. Would you really do that for a 2560×1440 display which would raise the cost of the machine significantly, or save the $150-200 and get a 1920×1080 instead? If Acer got the noise to a decent level and offers more that 4 GB RAM this could be a winner. Looks great but the price is actually so far off base it’s an insult.